Retailers and suppliers are expanding their collaboration on digital commerce strategy, category insights and design and execution of new shopper experiences. TPG has led partnership projects between retailers and suppliers for over 25 years and recently led an industry group of 18 suppliers and retailers to define a lean and action orientated process to develop an eCommerce and Digital Category Plan for growth. This process was initially entitled eCommerce Category Leadership… the scope is now widened to Digital Category Leadership. Define: TPG facilitates a re-imagining of the category as a digital solution which may be wider/larger than the traditional in-store category definition. Discover: Using a proprietary set of 40+ insights questions we collaboratively identify the big focus areas and then plan the right data/research sharing to unlock the answers. As inputs we also execute Digital Commerce audits to uncover pricing and promotional gaps and opportunities. Retailer best in class examples also fuel the insights work. 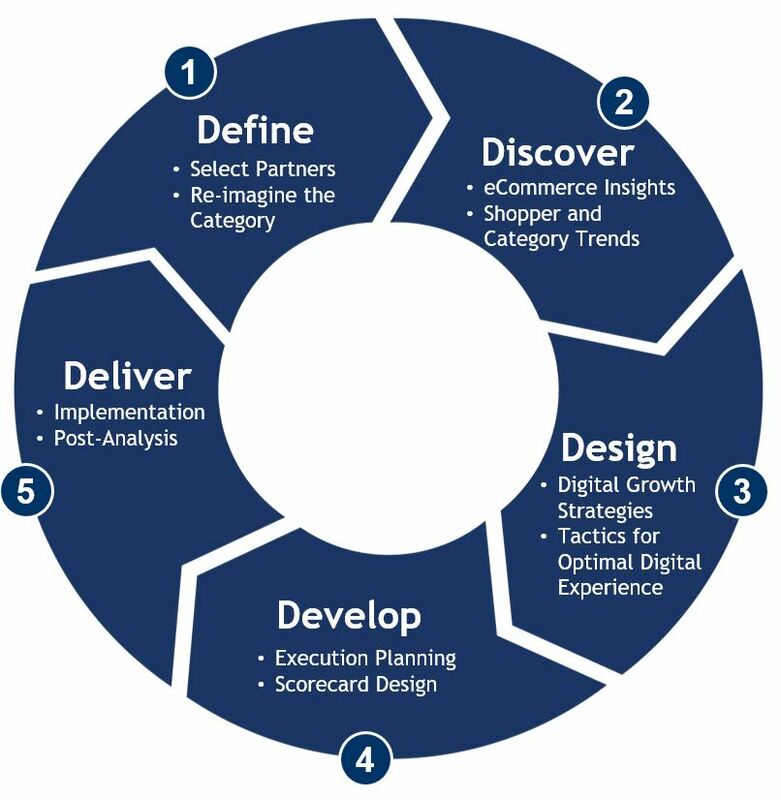 Design: Based on our insights we develop 2-4 key Digital Commerce growth strategies. Within each strategy are key tactics designed based on examples from TPG dealing with all aspects of digital commerce from assortment/promo to site and app experience to digital marketing and finally supply chain. Develop and Deliver: Once prioritized, each tactic is fleshed out into an execution plan to provide clarity on owners between the supplier and retailer and deadlines. Weekly and monthly touchbases are executed to drive scorecard tracking and post analysis of tactics once live. This process is driving double digit growth tactic by tactic on A/B testing and/or pre/post analysis while also building a deep and valuable partnership between retailers and suppliers. Finally, we see dramatic improvements in the shopper experience digitally and its impact on store and eCommerce sales.